Action involving Selston, who returned to the top of the table with a 1-0 win at West Bridgford. 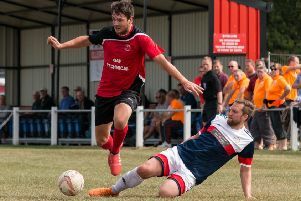 Title-chasing Selston regained top spot in the East Midlands Counties League, Premier Division after a single-goal defeat of West Bridgford. The outcome might have looked straightforward on paper, with Bridgford in the bottom five of the table. But they had suffered one defeat in their previous seven games and had beaten high-riding Eastwood Community on their latest outing. It turned out to be a tight affair, settled by a Kenan Layton strike shortly before half-time. Stand-in skipper Sean Gregory drove into the box and pulled back a terrific ball from the byline for Layton to smash home from six yards at the back post. Earlier, Bridgford’s Ryan Whitehurst had been denied by onrushing ‘keeper Simon Baldwin in a one-one-one before Selston’s Dominic Airey was foiled by a fine save, low to his left, from home goalie Sam Clark. The hosts had as much of the play as Selston, and in the second half, Baldwin had to be alert to save from Jack Oldham and Whitehurst again. The visitors’ best chance of a second goal came when Mikey Dunne’s decent effort from 12 yards was saved by Clark. The win lifted Selston three points above Newark Flowserve, whose game at Rainworth fell foul of the weather.